Tilted Horizons: Revzilla Helmet Giveaway! Could you use a new, top-quality helmet? For free? Than get thee to RevZilla's June contest page, spend about 30 seconds creating a Rider Profile, than sit back and wait for the monthly winners to be drawn. 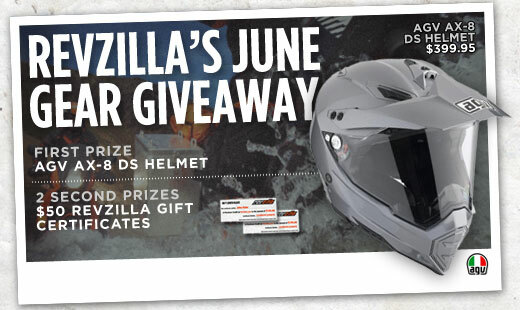 The First Prize winner this month will receive an AGV AX-8 DS helmet, valued at about $400. Two Second Prize winners will receive $50 Revzilla gift certificates.